NEW YORK (Reuters) - Oil prices slipped on Tuesday in choppy trading as weak economic data fueled concerns about demand that have contributed to crude's 15 percent decline so far in May. The dollar index .DXY seesawed with the euro and the greenback's weakness late helped oil pare losses, traders and brokers said. U.S. crude for June delivery slipped 46 cents to settle at $96.91 a barrel, having fallen as low as $95.02 on the day that June crude options expired on the New York Mercantile Exchange. U.S. crude trading volumes were 5 percent above the 30-day average, while Brent volumes were about the same percentage below, with two hours left in post-settlement trading. "With the housing numbers coming in soft and industrial production coming in (near) flat, there is some concern there will be a double dip in the housing slump and on a broader scale for the economy as a whole," said Rob Kurzatkowski, futures analyst with OptionsXpress in Chicago. "We're seeing further liquidation on the precious metals, and that's offering some outside pressure on the oil market as well." Copper ended lower for the first time in four sessions as the weak U.S. economic data weighed on the industrial metal. Weak U.S. retail and corporate earnings and the dollar's early strength pressured gold. The euro bounced and rose against the dollar in choppy trading, but remained vulnerable on concerns Greece might restructure its massive debt. The dollar index .DXY, measuring it against a basket of currencies, edged lower late after earlier being bolstered by the yen's weakness. Rising water levels on the Mississippi River looked less likely to hurt eight refineries in Louisiana after U.S. Army engineers began opening flood gates, helping keep the pressure on U.S. gasoline futures. "People who bought on the threat refiners would be affected by the floods sold yesterday and we're seeing this again today," said Tom Knight, trader at Truman Arnold in Texarkana, Texas. The gasoline crack spread, or profit margin for refiners, pulled back more than $3 to just above $25 a barrel, after pushing above $40 on May 10. U.S. retail gasoline demand fell last week compared with a year ago, but was up versus the previous week, a report from MasterCard Advisors' said on Tuesday. 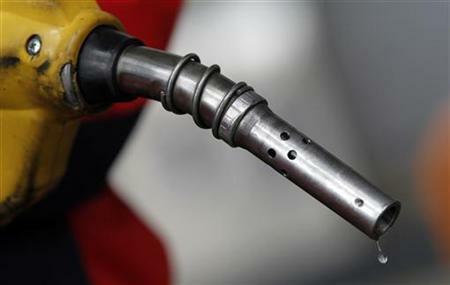 U.S. crude inventories are expected to have risen for the fourth straight week as higher imports outpaced refinery demand, a preliminary Reuters poll of analysts showed on Monday. Gasoline and distillate stockpiles were also expected to be slightly higher.